Roxanne Martino is a 1977 Notre Dame graduate who went on to become the president and CEO of a Chicago firm that manages $8 billion in money from hedge funds. 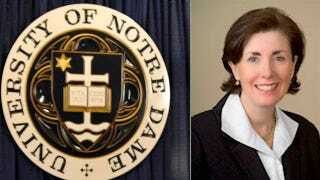 Two months ago, she was appointed to Notre Dame's board of trustees, but now she's resigned amid scandalous accusations. Her crime? Donating to a charity that supports pro-choice female candidates, and another that helps women and girls. The Chicago Tribune reports that Martino has resigned following an expose last month by the Cardinal Newman Society, which monitors whether or not Catholic colleges and universities are upholding the faith. A post on the Society's blog reported Martino gave $16,150 to EMILY's List and between $3,000 and $6,000 to the "pro-abortion Chicago Foundation for Women." "On the basis of a recommendation from others, she made contributions to two organizations, and she regrets that she did not personally review their activities ... That she erred in not knowing completely about two of the many organizations to which she makes contributions does not in any way diminish the exemplary way in which she has lived her life and faith." Chicago Foundation for Women made grants to the Chicago Abortion Fund, Planned Parenthood/Chicago Area, Planned Parenthood of Illinois, the ACLU Reproductive Rights Project, and Black Women for Reproductive Justice. The Foundation's website also notes that it supports the Illinois Campaign for Reproductive Health and Access, which seeks "to organize around the advancement of a broad pro-active, pro-choice agenda." "I dearly love my alma mater and remain fully committed to all aspects of Catholic teaching and to the mission of Notre Dame," Martino said in a statement released by the university. I had looked forward to contributing in this new role, but the current controversy just doesn't allow me to be effective." In all likelihood she had some idea that she was supporting pro-choice organizations, and like many people, still considers herself a Catholic even though she doesn't agree with every last one of the church's policies. Jon O'Brien, president of Catholics for Choice, said this incident demonstrates, "the lunacy of the extreme uber-conservative Catholics who represent really a minority opinion with in the church." Martino may not be able to serve the school she loves as a trustee, but at least she can take comfort in knowing that she's in good company. The Cardinal Newman Society has been looking at Notre Dame moreclosely since the school invited President Obama to give the 2009 commencement address and receive an honorary degree, igniting a huge controversy. Apparently having a sitting president speak at your university is reprehensible if you happen to officially disagree on a woman's right to choose.